In Nashik, elite cosmetic surgery center is one of the best cosmetic surgery centers where we do Laser skin rejuvenation which works to firm the skin plus it smooths out the skin’s texture and imperfections. This process includes the replacement of old and damaged skin with fresh skin by stimulating the regrowth of new and healthy collagen. Treatments of a number of skin imperfections are also be included. our skin produces new skin cells known as cell turnover, which travels from the lowest layer of the epidermis to the top layer before we shed them. This happens every 28 days when we’re in our 20s, every 38 days in our 30s, every 48 days in our 40s and so on. As you can see, as we get a little wiser, our skin’s metabolism slows down and we don’t produce new and youthful skin as fast. This is why skin imperfections, such as blemishes and scars, linger around longer. we notice the new and unexciting changes in our skin like laxity, lack of glow, fine lines and other pigmented lesions. While that information may seem a little daunting, to fight the aging process there is a way and for that elite cosmetic surgery center provides you Laser skin rejuvenation which will helpful to speeds up our skin’s metabolism and makes it act like a 20-year-old’s. This laser facial uses Nd: YAG laser technology for non-ablative skin rejuvenation. It’s the perfect “lunchtime pick-me-up” (a session takes 45 to 60 minutes for the whole face) and is ideal for all skin types from super fair to chocolate.elite cosmetic surgery center helps you to get back your look youthful by skin rejuvenation technique at an affordable cost. Laser Skin Tightening uses an infrared light source (a laser) to tighten skin by heating the collagen under the skin’s surface, causing the skin to contract (tighten). It is a minimally invasive, non-surgical process. After treatment Facial skin tightening is noticeable immediately, and there is no downtime, making this an increasingly popular procedure. Optimal results usually require two or three treatments about a month apart and additional skin tightening occurs over the next few months. For the reduction of fine lines, wrinkles, and skin laxity, Laser skin tightening is an FDA approved method. Patients enjoy moderate results with no downtime but laser skin tightening results may not be as dramatic as those of a facelift. 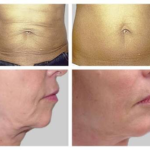 If you wanted to restore a more firm, youthful appearance to skin all over the body then laser skin tightening will be more beneficial for you. So if you wanted to regain confidence which is lost due to unhealthy skin then must-visit Elite cosmetic surgery center which provides you Laser skin rejuvenation treatment at affordable cost.